The latest token on the block? $DONUT — tokenized /r/ethtrader karma! Simply deposit your karma at https://donut.dance/ and it gets converted to an ERC20 token. That same token can now be sold on Uniswap or Radar Relay. What makes this amazing is it demonstrates the compostability of web 3. For example, if I believed that $DONUTs were overpriced due to their novelty, I could use dYdX to short them (provided there’s enough liquidity). If you’re interested in reading more I highly recommend checking out Jessie Walden from a16z’s piece about it: https://a16zcrypto.com/2018/12/4-eras-of-blockchain-computing-degrees-of-composability/. While we’re on the topic of tokens, it seems like the United Kingdom’s security commission has rejected the notion that a utility token must have a certain amount of functionality to not be deemed a security. I highly recommend reading this piece from Marco Santori about it: https://twitter.com/msantoriESQ/status/1088129402959990784. That’s a wrap for this week, catch you all next time! Enjin Wallet, a popular Ethereum Wallet, has integrated Kyber’s liquidity protocol to allow users to swap ERC20 tokens from within the Enjin wallet. This integration, to be launched on 29 Jan 2019, demonstrates how Kyber enables token swapping functionality to be embedded into any wallet and DApp to provide a seamless user experience. Kyber has introduced the Automated Price Reserve (APR), created with ease of maintenance as a top consideration. The APR will be one of the available choices that new liquidity providers can use to provide liquidity to the ecosystem. Loi was listed as one of MIT Technology Review’s 10 Innovators Under 35 APAC for his work on the public blockchain, and spoke alongside inspiring scientists and technologists leading the next wave of innovation at EmTechAsia. We are proud to announce the New Origin Identity. Self-sovereign identity is one of the foundational building blocks of our Origin platform as it allows buyers and sellers on the Origin marketplace to build trust while giving them full control of their personal data. Try out Origin Identity today by going to the Origin DApp and creating a profile and a few attestations yourself! Origin held its second official Team Offsite this past week. It was a great opportunity for all of us to meet here in SF, and engage in many memorable team-building activities to create & sustain new ways of communicating and collaborating. We are deeply thankful for everyone who is part of our community. Stay tuned for our Team Offsite Medium post. One thing we need help with: Please continue to checkout our Origin Marketplace DApp & try out our New Origin Identity today. We encourage everyone to try creating a listing on our DApp, and try buying and selling using real ethereum. Lastly, Origin is proud to support KryptoSeoul’s first SF meetup next Monday (1/28), and will be speaking along with other prominent projects such as Cosmos, 0x, and Celer Network to discuss lessons learned in 2018 & share insights into future outlook for 2019. Please RSVP here and say hello! The beta of Parity Fether, a light client-based wallet for Ethereum networks, is out now. Parity Ethereum new versions 2.2.7-stable and 2.3.0-beta support the Constantinople postponement. There’s now a Substrate Reddit. We’re hiring a Developer Advocate and Tech Ambassador, among other roles. We’re hosting Graph Day on January 25th at the Grand Theater in San Francisco. The day will focus on what’s needed to make Web3 go mainstream with speakers from eWasm, LivePeer, Compound, and other projects. Talks will cover the latest in protocol design, dApp adoption, scaling, UX, and investment theses. KRWb, a 1:1 Korean Won backed stablecoin, has launched and will proceed with a live beta period over the next few weeks on AirSwap. We will make an announcement on our social channels once KRWb is live on AirSwap. Read more about KRWb here. We’re seeing a lot of interesting activity on AirSwap with updates regarding top stats published on our Twitter weekly! If you haven’t made a trade on AirSwap.io yet, we would like to invite you to give it a try. If you’re interested in what our team is working on at AirSwap, please submit an application in the “Careers” section here. Loopring is featured as a Top 3 protocol on Ethereum by Dapp.com 2018 Dapp Market Report. Loopring CEO, Daniel Wang, speaks about Loopring 2.0 and 2019 Development Roadmap in a livestream on the TokenClub app. Loopring Director of Business Development, Matt Finestone, attends the North American Bitcoin Conference in Miami, catching up with many of our friends such as Polymath, Decred, Qtum, and Quiknode. Community video submitted, Talking Loopring Cryptocurrency, by SmashingBloke. LRC is now available to trade with zero maker fees on Ethfinex! 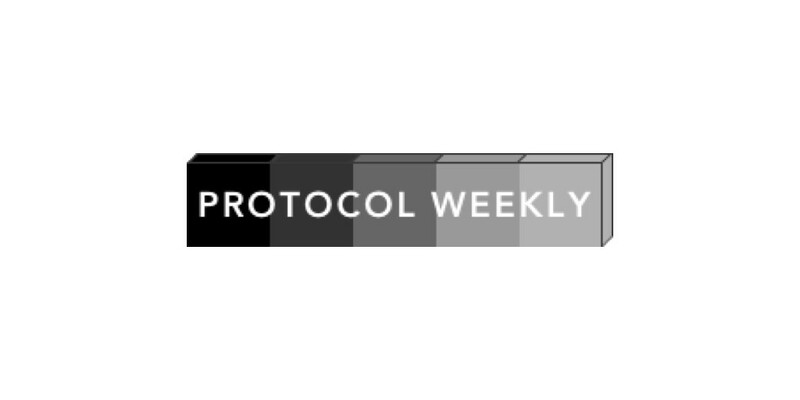 A busy few weeks, filled with integration work of protocol 2.0 with relay 2.0, continued research, and a few conferences in Asia and North America. We’d like to note that on Saturday, January 26th, Daniel will answer a Reddit AMA. Please ask your questions now! Parity, Loopring, Matic Network, Civic, The Graph, Origin Protocol, AirSwap, Kyber Network, Wanchain, Aion, ICON, CDx, Abacus Protocol, Enigma, Set Protocol, Codex Protocol, Colony, The Graph, POA Network, Quantstamp, Connext Network, Dharma Protocol, Paradigm, Market Protocol, Liquidity Network. Know a protocol that should be part of this list? Drop us an email at hello@8xprotocol.com.